Plant Description Hyclocereus Hybrid Some consider this the best tasting dragon fruit. It has a great balance of sweet and tangy. This dragon fruit is the result of years of research, crossing, and selection by Edgar Valdiva. Attractive vining fleshy stemmed cactus with multiple stems reaching up to 20 feet. It can withstand short periods of frost but more than that can damage or kill it. It grows in a wide variety of soils but does best in fertile soils. Because it is a cactus it is very drought resistant. Does very well in drier climates. Magnificent flowers are night blooming. Can have up to 4-6 fruiting cycles annually. Outside zones are 9-11. How to Grow Most all edible plants grow well in Full Sun, a little shade won't hurt. For starter plants I recommend growing in a 4 inch to 1 gallon pot to allow your plants to get a little bigger then then re-pot or plant. 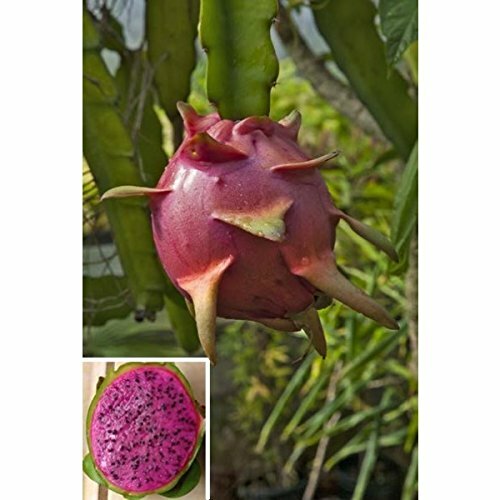 Dragon Fruit can be planted in most healthy soils with normal pH range 6.0-8. I recommend growing in an organic potting soil with the fertilizer and beneficials already mix in. Allow a period of drying out between watering. Smaller plants will wilt in full sun and heavy rain. Keep in partial sunny area until plants are larger. Dragon Fruit need support to grow like a metal stake. The price includes Four (4) "Edgar's Baby"' with USPS Priority Shipping. These are 2 inch rooted starter plants shipped in tray pots and are 1-2 inches tall. Hyclocereus Hybrid Some consider this the best tasting dragon fruit. It has a great balance of sweet and tangy. This dragon fruit is the result of years of research, crossing, and selection by Edgar Valdiva.